Fortunately for our planet and our wellbeing as creatures that inhabit it, organic food is becoming increasingly more popular. In fact, one might even call it an “organic food craze.” The competition on the organic food market is a stiff one, for sure. There are just so many restaurant and shop owners, farmers and resellers in the game, it’s often very hard to stay afloat in this sort of market. The harsh truth is that your business cannot rely on the quality of your products alone. You need a proper channel to offer your products and services to your target audience, and there is no better way to do it than through a website. Even better – a website built using one of the best WordPress themes for organic food and restaurants! WordPress is known as the most user-friendly platform for business owners, even those who are not particularly skilled in web design or coding. It allows you to create beautiful pages and showcase your products in a way that will help your business grow. This being such a popular line of business, there are tons of WordPress themes for organic food and restaurants out there. It’s great to have such a wide choice, but when it comes to actually deciding, it can be a tough call. This extensive list of 20 best WordPress themes for organic food and restaurants was created with one goal in mind – to help you find the best theme for your organic food business, be it an online shop or an organic food restaurant. If you’re in the market for a cool-looking, clean and responsive WordPress theme, keep reading. Hereford is a beautifully crafted theme that can serve multiple purposes. It is ideal for agriculture, farming and food manufacturing, and it also makes a great solution for organic food production and distribution. It has a healthy, earthy feel to it, with images that evoke that sweet smell of fresh, farm produce and food that is just, well, healthy. On the technical side, Hereford is a WordPress theme equipped for just about anything one might need for an organic food and restaurant website. It comes with six pre-designed homepages. One of them is dedicated entirely to organic food, with mouth-watering images and an online shop that easy to set up and manage. On the other hand, if you’re feeling inspired and have a little time on your hands, you can make use of the built-in Visual Composer. This powerful plugin allows you to customize your site simply by dragging and dropping different elements around and adding your own content. You can add textures and background images for a rustic feel, and you can also play around with drop shadows, borders and what not. In addition, blogging and sharing your favorite recipes is made easy with just a few clicks. On top of all this, Hereford is equipped with a sturdy yet intuitive admin panel, widgets for easy social media integration and a plethora of useful custom shortcodes. Hereford is an elegant, professional and highly functional theme that will definitely improve your brand visibility and help your organic food business grow. Running a restaurant is a big, often stressful business and naturally you want your website to work for you and relieve a bit of that load from your shoulders. There are plenty of amazing WordPress themes just for that, but not that many that play the part as well as Cuisine does. This WordPress theme for restaurants is highly customizable. You can use it for your organic food business just as well as for a butcher shop or a bakery. Cuisine is fully equipped for just about anything you might need for a successful restaurant website – there is the Menu section, the Offers, a page where you can list your own specialty cuisine and highlights, an easy to use booking form with openings, Yelp reviews, feedback/contact form…. You name it, Cuisine’s got it. It also features three different homepages you can use with just one click. You can also decide to build your own homepage basically from scratch, using the integrated Visual Composer Drag&Drop builder. Another great thing about this theme is that it comes with a dedicated support forum to consult in case of any questions or if you run into a wall when trying to make something happen on your site. Whatever the format of your establishment is – be it a fancy organic restaurant, a fast food place, a simple café or a hip boutique eatery – Cuisine will fit right in with your needs. When you first look at this WordPress theme, you are struck by how beautifully designed it is and how cute it all looks. But, make no mistake, under the hood, Succulents is a powerhouse of features and functionalities for just about every business need. As far as WordPress themes for organic food and restaurants go, this one is definitely right there at the top. It has a number of practical inner pages, a timetable responsive schedule you can use for booking and managing appointments and classes, an online shop and highly customizable portfolio layouts. Something that sets this gorgeous theme apart from the others in the similar niche is the fact it comes with a super-useful, cute set of recipe templates. You can use these to share your culinary inspirations and tips, displaying single recipes or arranging them in lists and attention-grabbing sliders. This WordPress theme for organic and healthy food comes with the Visual Composer, saving you $45, which is how much this plugin normally costs. Also included are the nifty Slider Revolution (worth $25), parallax sections and widgets for your Instagram and Twitter feed and other social platforms. This is a theme that gets you craving for healthy food the moment you set your eyes on it. We are sure your visitors will feel the same way, should you decide to go with Succulent. Sophisticated, modern and smart, Elaine is one of the most gorgeous WordPress themes for organic food and restaurants and healthy living. With a distinct organic homepage included, it has just about everything you need for your organic food business. Elaine comes with some of the best WordPress plugins on the market right now. You get the intuitive, fun and easy to use Visual Builder, allowing you to literally drag and drop items around your website until you’re 100% happy with what you see. It also includes Revolution Slider and Timetable plugins for the best browsing experience. If you’re in the business of selling organic food and other health products, WooCommerce is here for you to make your job a piece of cake. You get to create a beautiful shop that your customers will enjoy browsing and shopping at. If, however, you’re running a restaurant, you’ll be happy to hear that Elaine features a delicious restaurant menu, as well as reservations and the previously mentioned timetable to help you showcase your events and schedules. Elaine is 100% responsive and well-documented and the support team does an amazing job at solving your problems in a quick and easy manner. This stunning theme will charm your website visitors with the graceful simplicity of its design and robust functionalities under its hood. Frappé is a theme created with organic, health and juicing enthusiasts in mind. Visually, it is brimful of delicious graphics and illustrations to get you in the mood for a nice organic juice or a smoothie. This theme is cute as a button, but it is also sturdy as an oak. Frappé brings a variety of features that will help your organic food and restaurant business grow. For one, there is the incredibly useful and gorgeously designed menu template that you can (and should!) use to showcase your organic products, as well as your prices and special offers. You can create as many inner pages as you like, as this WordPress theme for organic food and restaurants comes with a variety of templates. If you’re in the business of selling your organic products, you’ll be happy to hear that Frappé is fully compatible with WooCommerce, which is the best e-commerce plugin around. Blog pages are also available for those who want to share a bit of their health and organic lifestyle wisdom. Vertical showcase feature, animated slider and rich typography options are included to make sure your website looks and feels just the way you want. Frappé was obviously created with the hip, health-conscious crowd in mind, so if that fits your ideal customer profile, look no further – this is the right theme for you. Superfood is a beautiful, clean WordPress theme for organic food and restaurants that comes packed with advanced features and allows for great versatility, thanks to the intuitive and practical Visual Composer builder. This stunning theme comes with as many as 12 different homepage layouts for various business purposes. One thing that catches your eye immediately is the blog page, so gorgeously crafted it will make you want to start a blog and share your thoughts and ideas on organic food with your visitors. We strongly recommend you make use of this feature since, as far as blog pages go, this is as pretty as it gets in this particular niche. Demo site can be imported with just one click and the admin panel is user-friendly and efficient. This basically means that, should you opt for Superfood for your organic food and restaurant website, you won’t need any coding knowledge whatsoever. The theme practically runs itself, as long as you give it just a little TLC. Contact Form 7 is included, so your customers can easily get in touch, and there is also a Google Maps shortcode that makes it clear where they can find you. Social sharing shortcodes allow for quick and easy integration with your social platforms. This theme has a truly premium feel and has all the features you could ever need for your organic, agriculture or health food-oriented business. Advertised as modern and sophisticated, Nuvo is precisely that. On the market of WordPress restaurant themes, this one stands out with its supreme functionality and elegant design, rich feature pack and great ease of use. It can be used for any type of restaurant, café or bar, as it comes with demos that can be adjusted to fit any type of establishment. When it comes to features, as we already said, Nuvo has plenty of them. With this WordPress theme, you get the Revolution Slider and Visual Composer that allow you to build gorgeous pages without any previous expertise in the field. Parallax scrolling is included for a modern, hip feel, and the theme is 100% responsive and guaranteed to look amazing on any screen size. Another great thing about Nuvo is that it comes with a handy Menu Builder with some special options (“Chef’s Special” and “Suitable For”) so you can list all your appetizers, main courses, desserts, wine and cocktail lists, kids’ menus and other. The Reservation Management feature allows your customers to book a table through your website and receive an automatic confirmation email, which is something they will certainly appreciate. On top of all that, Nuvo assists you in management of all your special events through a special feature, now with the Event Countdown ticker. All this, combined with the integrated online store, make Nuvo the one of the best, most practical WordPress theme for organic restaurants around. Biolife is an e-commerce theme for organic food, farmers, eco-friendly, healthy and beauty products. As such, it is focused on helping you boost your online sales records by showcasing your products in an exciting and modern way. Biolife is simply perfect for an online organic food shop, and for a number of reasons. First of all, it comes with 5 beautiful premade homepage layouts to choose from, and they are all 100% responsive and retina ready. Second, Biolife has Mega Menu, Ajax Add to Cart, multiple header and footer options, Brand Logo slider and catalog mode. Furthermore, it has multi-currency support and is translation ready, which is important for business owners relying on foreign customers and international trade. But that’s not nearly all that this terrific WordPress theme for online organic food shops has to offer. Biolife has multiple vendor support, in case you want to team up with partner retailers, and its code is optimized for great speed and SEO. This is particularly important for e-commerce, since you want to get as many visitors turning customers through your website. As you can see, Biolife is extremely functional and packed with useful features, some of which you perhaps never knew you needed. On top of all that, it is truly a beautifully designed theme, so you know you got your visual aspect covered as well. Perennial is among those WordPress themes for organic food and restaurants that immediately strike with the beauty of their design. There are eight homepage demos and deciding which one looks the best is basically impossible. Aesthetics aside, Perennial has a lot to offer in terms of features. If your idea is to run an online organic food store, the WooCommerce plugin comes with Ajax mini cart, two product display style attributes, wishlist click notification and product trending. Visual Composer is included for free, allowing you to build your website any way you want with great ease and without having to write a single line of code. It is extremely customizable, with multi-layout and color options and Google fonts. Other plugins that you get for free with this theme include Contact Form 7, MailChimp for easy email campaigns, OptionTree for smooth page administration and 7up Core. Your customers will surely appreciate the multi-currency feature, as well as the fact that your website, thanks to responsive design, looks amazing on smartphones and tablets. Finally, there is a blog module included if you want to share your thoughts, ideas, recipes and news with your customers. Modern, sophisticated and responsive, Perennial is a strong little theme that we are certain will help you send your business skyrocket. This WordPress theme has everything you need to successfully run an online organic food store, and it is also fit for any healthy and natural food website, such as farm-to-table, gastro tourism, winery, dairy farm, environmentally conscious living or even a lifestyle blog. Thanks to full WooCommerce compatibility, you can sell your products online and engage your customers using social buttons and widgets. You can use one of the premade homepage layouts or build a page the way to see fit, since this theme comes with the popular Visual Composer website builder. The theme is designed in a dynamic, informative way and the supported sticky menus offer better navigation and overall user experience to your visitors. Organic Store comes with extensive help and support documentation so you should have no trouble setting up the website by yourself. If you do happen to run into any sort of difficulty, the support team will be right there to give you a hand. This WordPress theme for organic food and restaurants is not only multi-language compatible, but it also comes with an RTL version included, meaning you can use your website for right-to-left languages such as Arabic, Hebrew, Farsi and Urdu. Organic Store is a comprehensive, reliable and gorgeously designed theme that is easy to implement and manage. All things considered, we believe it will give your organic food business a much-needed boost. This responsive WordPress theme for organic restaurants, organic food retailers, agriculture and farm products and businesses is elegantly crafted and packed with handy features and state-of-the-art WordPress plugins. The Menu template allows you to entice your visitors with mouth-watering meals, divided into Main, Brunch, Desserts, Raw Bar Drinks and other sections you might want to offer, complete with hi-res pics of your dishes and their prices. You can use the elegant Events page to list your special events with details and event times and the Recipes page is something we’re sure your visitors will appreciate. After all, everyone loves a good recipe, right? Another thing we really liked about this WordPress theme for organic food and restaurants is that it allows you to list the nutritional info about the food you offer. Let’s take a look under the hood for a second. Vincente’s incorporates interactive Ajax search, user menu and main menu support and comes with a shortcode builder and media content manager. When it comes to plugins, this WordPress theme is compatible with Revolution Slider, WooCommerce, Contact Form 7 Essential Grid, MailCimp and many other useful WordPress plugins. Overall, Vincente’s is among the best WordPress themes for restaurants on the market, and it can easily be customized according to your organic food and restaurant business. Organic Web Shop is a WordPress theme with WooCommerce integration, meaning its main purpose is to help you sell your organic products online. Easy to set up and with clean, smart design solutions, it is among the top WordPress themes for all things organic, eco-friendly, farm-fresh and generally health-related. The style of the theme is in line with healthy lifestyle trends. It is bright, unpretentious and cheerful. Moreover, it is designed to boost your product visibility by offering you the chance to present your merchandise in a number of ways. You can choose to highlight products (Top Sellers, On Sale, Freshly Added) or to divide them into categories (Bread, Fruits, Vegetables, Herbs & Spices, and so on) for easier navigation. Organic Web Shop also allows you to set up a 24/7 hotline, which is always a nice touch. The theme is, of course, fully responsive. This is vital for any business since more and more people do their grocery shopping online. This is particularly true for organic food, as the brick-and-mortar shops may not always be available in all areas. Should you decide to make your page multilingual, you can do so thanks to the .po and .mo files that come with it. And if your market belongs to the right-to-left languages, Organic Web Shop supports that option as well. AmyOrganic is a WordPress theme for organic food that simply oozes health. In fact, one look at it and you can almost smell the orange juice and ginger. In addition to being visually appealing and fitting for its purpose, this theme is also highly functional and packed with awesome features. Thanks to the supremely clean code, the theme works amazingly well, without glitches. Still, on the odd chance something goes awry, you can count on the support team for help. AmyOrganic comes with five homepage styles, three header styles, three product page layouts and a wide range of custom skin colors to choose from. What sets AmyOrganic apart from other high quality WordPress themes for organic food and restaurants is the Countdown, a cool little feature you can add to display your sale countdown. That’s not all – with this theme you can also include client testimonials on your pages, using neatly designed, premade Testimonials templates. Also included in this theme are a bunch of cool widgets and useful plugins, as well as a powerful page builder (Visual composer). AmyOrganic is compatible with all major social platforms – Facebook, Twitter and Pinterest. On top of all this, e-commerce function is available thanks to WooCommerce compatibility, and there are also advanced blog options you can make use of. Although it can be used for just about any sort of produce or health food shop, Green Organic is particularly suitable for organic food retail and distribution businesses. It includes a set of three neatly designed homepage layouts, as well as additional pages for Shop, Blog, About Us, Contact Us and 404 Error. But that’s not all – this WordPress theme for organic food and restaurants is fully equipped with useful features and plugins. For instance, it features the best-selling WordPress plugin, Visual Composer, which means you get to build your website all by yourself (if you want to, of course), without any particular knowledge required. It also comes with Slider Revolution, the ever so popular premium slider solution. Visitors can also opt to sing up for your newsletter, which is a great way to keep them informed and engaged and a precious lead generation tool. Furthermore, being SEO-optimized, the Green Organic theme will help you position high on the search engine results pages. This organic food WordPress theme also meets one important factor: it is fully responsive. In case you don’t know what this means, let’s put it simple – your entire website and all of its pages will look (and work) just as stunning on smaller devices (tablets, smartphones) as they do on desktop and laptop computers. Of course, this theme is fully functional in the sense of e-commerce, thanks to the compatibility with the powerful WooCommerce. If you choose this theme for your organic food website, you will find that it serves the purpose more than right. Here’s a theme that sets a visual tone that is a bit different from what you’re normally used to in terms of organic and healthy lifestyle. Caverta is a theme with a strong personality, a bit rugged, a bit rustic, but definitely exciting. Most importantly, it is a clean and neatly developed theme that is bound to meet all your business needs. One of the great things about this WordPress theme for organic food and restaurants is that it comes with the start theme installation service. This is something that is seldom seen in other WordPress themes for organic food and restaurants. Full documentation and professional support are provided in case you run into any difficulties during setup and use. Caverta is a highly customizable theme. You can change everything about it – from the color scheme to the fonts. The default content is included, meaning your page can be up and running just as it is shown in the demo in no time. This theme comes with the Elementor Drag&Drop builder, as well as WordPress live Customizer, both of which are known for their ease of use and flexibility. Speaking of flexibility, Caverta includes multiple blog layouts, four menu page templates, and two contact page templates. If you’re running an organic business and you don’t want your website to be all ginger roots and lime slices, consider giving this awesome theme a shot. Although it is not a strictly organic food restaurant theme, Picante is so good, we just had to include it in this list. As far as restaurant WordPress themes go, this one is among the best. This stylish theme has a truly premium feel and you can just tell the developers invested a lot of care and effort in it. It has eight different demos, and one of them is organic, so you can just go ahead and use that one without having to make any changes to the original layout. If you do decide to change anything about the theme, though, you’ll be pleased to learn Picante comes with the exclusive codeless Live Visual Builder. This handy tool is very user-friendly and intuitive and can get you a long way in terms of customization. Another interesting thing about this theme is that you get to combine different content blocks from different demos. You like an element from the Umami template and you want to use it for your Organic template? Done and done. How cool is that? Other noteworthy things about this theme include reservation functionality with Open Table, premade headers and footers, cool-looking menus and WooCommerce compatibility for selling products online and offering delivery. Picante is clearly an ideal solution for everyone looking for a smart, elegant and highly efficient WordPress theme for organic food restaurant. Organici is a cute little WordPress theme designed specifically for organic food industry and all its branches, be it a mom-and-pop organic food shop, an upscale restaurant, a bakery or a juice bar. It has all the functionalities one might need to run such a business, and the design is bright and fun. All this cuteness doesn’t mean Organici is some feeble, easily broken theme. On the contrary, it comes with a very sturdy backend interface that is, nevertheless, rather easy to use. This theme’s fast loading pages are easily customizable with just a few clicks, and there are nine beautiful homepage demos to choose from. As for the plugins, Organici’s game is quite strong. There’s the popular Slider Revolution, as well as WPBakery builder and Contact Form 7. In order to stand out from other WordPress themes for organic food, Organici offers a unique feature – special boxes, created to help you sell your products more efficiently. Finally, Organici is SEO-optimized, translation-ready, has a live theme customizer, unlimited colors and Google fonts and Mega Menu support. 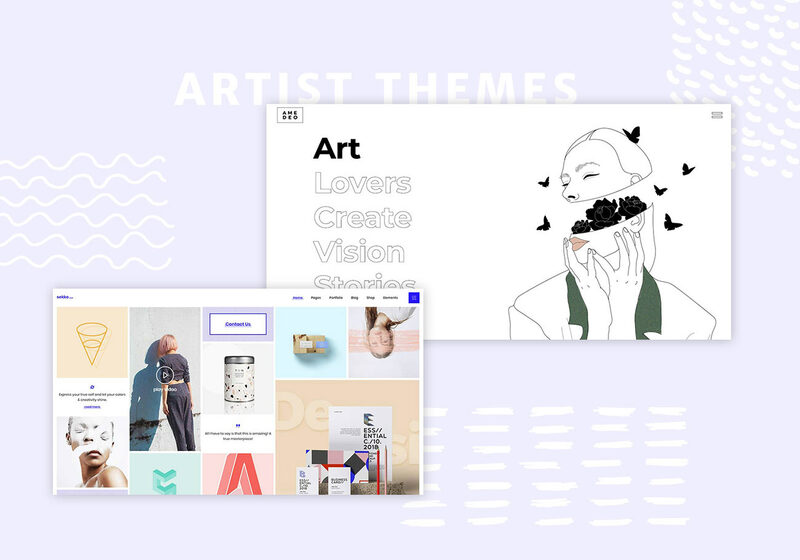 This eye-caching theme is 100% responsive so you can count your website will look amazing on desktop and hand-held devices alike. Food Store is a theme that stands out among other WordPress themes for organic food and restaurants for several reasons. The main one is the fact it has as many as 32 different demos to choose from. You can opt for one of the elegant food store or drink store demos, and there are food market demos as well, tailor-made for online stores. And the best thing is, all demos can be easily imported with just one click. As for e-commerce, vendors can create multiple stores, manage inventory and shipping, offer coupons and what not. All these functionalities are available thanks to the integrated Dokan, WC Vendors and Marketplace plugins. Your customers can view each of your products to the smallest detail with the 360° product viewer, and the modern Off-Canvas Cart is added for a smoother shopping experience. Creators of this WordPress theme for organic food and restaurants have paid particular attention to mobile during design and development. All demos are 100% responsive and work and look great on all types of hand-held devices. Another interesting thing about this bright, smart theme is that it comes with an opt-in newsletter popup. This feature is extremely useful in lead generation and ultimately help you boost your sales. If what you’re looking for is a well-documented, GDPR-ready, clean and fast theme that comes with a variety of customization options, the gorgeously designed Food Store might be just the thing for you. Organic is one of those WordPress themes that have been designed with one specific purpose in mind, and that is to help organic food business owners boost their sales and get more customers. It has been created with a great understanding of what kind of online organic food store the customers care about and how to attract them. The design is bright and crispy clean, with a wide variety of useful features to help you achieve your business goals. Should you go with Organic, you will be able to effortlessly set up and manage an online store to sell your organic or farm goodies. The powerful WooCommerce integration includes Wishlist, Quick View and Sales Badges features and there are two distinct shop layouts. However, selling organic products online isn’t nearly all you can do with this theme. There is a separate Recipes page that you can use and that we are sure your customers will love. There is also the blog, of course, that you can and should use to improve your site traffic using engaging content. This gorgeous WordPress theme for organic food, restaurants, farms and health food in general includes parallax image and video scrolling sections, Slider revolution and virtually unlimited color options. Built on Twitter Bootstrap, it automatically supports the widest range of super-useful shortcodes. In addition to detailed online documentation, the team behind Organic also offers video tutorials. Another amazing organic store WordPress theme, Greenfarm is perfectly suitable for all sorts of environmentally conscious, eco and health food businesses that want to sell their products online. Based on WooCommerce, this online store theme has four premade homepage layouts and several inner pages, including the Frequently Asked Questions, About Us, Blog, Error 404, Portfolio, and, of course, the Shop itself. All this can be arranged and organized by customizing the Mega Menu settings and choosing between different header types that are offered with this theme. Greenfarm allows for multiple product list options. You can arrange the products in “Featured,” “Best Selling,” “New,” “Sale,” and such. There is also a cool Daily Deal module. The product image gallery has the Zoom feature while the Quick View feature allows your customers to view different products right there from the home page. Greenfarm also comes with Ajax Add to Cart and Ajax Layered Navigation with different filters. The list goes on and on. The creators of this WordPress theme for organic food online stores obviously wanted to make sure you, as the site owner, get all you need with little to no effort. Theme designers did a great job too, as Greenfarm really has a cool, modern and dynamic feel to it.